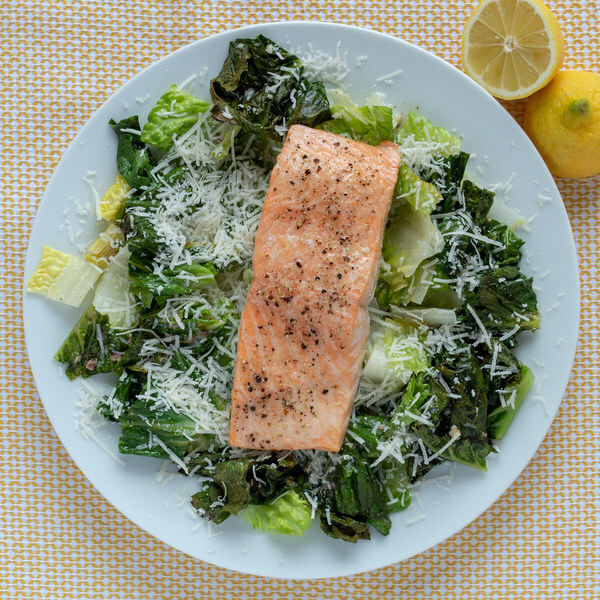 ← Warm Roasted Caesar Salad with Baked Salmon. Preheat oven to 425°F. Line two baking sheets with parchment paper (optional). Wash and dry the fresh produce. Leave the lettuce intact while washing. Peel and mince garlic and transfer to a small bowl for the dressing. Mince the anchovy fillets and add to the bowl. Add salt and stir to combine. Juice the lemon and add to the dressing bowl. Add mustard, olive oil, and pepper; whisk together. Pat the salmon dry with paper towels and place, on a sheet pan. Rub the salmon with olive oil and season with salt and pepper. Place the salmon in the oven and roast for 5 minutes while you prepare the lettuce. Cut romaine lengthwise and rub with ¾ of the dressing. Place lettuce on the second baking sheet and place in the oven for 7-10 minutes, until the salmon is cooked through and the tops of the lettuce begin to char. Finely grate ½ cup of Parmesan. Remove the pan from the oven. Sprinkle the lettuce with the Parmean cheese. Chop the lettuce into 1-inch pieces. To serve, arrange a bed of romaine on a plate, top with salmon and drizzle with remaining dressing. Serve immediately, enjoy!